Connecting the public with the Salish Sea Bioregion and its ecosystems through engagement, knowledge and awareness, the Shaw Centre for the Salish Sea offers a fun, interactive and informative experience of science and culture to young and old – welcoming over 75,000 visitors a year. It is a key tourist attraction and destination as the only aquarium in Greater Victoria and Canada's only aquarium and learning centre dedicated exclusively to the Salish Sea. Located on the breathtaking Sidney waterfront - on the traditional lands of the WSÁNEĆ Nations of the Coast Salish Indigenous peoples - the Shaw Centre for the Salish Sea opened in 2009 and is an award winning aquarium and learning centre dedicated exclusively to the Salish Sea Bioregion of BC. A unique non-profit organization, the Centre combines live aquarium habitats and marine mammal artifact displays (science & nature) with a permanent Coast Salish art collection (arts & culture), as well as public and school learning programs and locally-focused Salish Sea Store - providing an amazing opportunity for learning, exploration, and conservation of the natural beauty, ecological diversity, and cultural story of the Salish Sea. The Centre, located in the Sidney Pier Hotel & Spa (through a donation of the Town of Sidney & Marker Group), is operated by the The New Marine Centre Society and its volunteer Board of Directors. As a not-for-profit organization, the Centre relies on community support through admission fees, partnerships and donations including Title Sponsor - Shaw Communications. The Centre is operated by an Executive Director, Senior Managers, and Board, as well as a team of highly dedicated staff of Marine Biologists (Aquarists), Educators, and Customer Experience professionals, as well as over 160 volunteers. Click here to see all of our partners. The Centre is a catalyst for building a healthy and sustainable environment by engaging people in stories about the science, culture, and traditions of the Salish Sea Bioregion so that we can protect and conserve it for seven generations and beyond. Our vision is for a healthy and sustainable Salish Sea Bioregion. Our mission is to create experiences that engage people to learn about, explore and conserve the Salish Sea Bioregion – its wildlife, waters, land, culture, and people. A bio-rich 110,000 square km inland sea and coastal land area of British Columbia and Washington State named for its original habitants, the Coast Salish Peoples, and known for its keystone animals – the Southern Resident Orca and the Grizzly Bear. The Salish Sea Bioregion is a place where the deep Pacific Ocean meets the nutrient laden waters of the great watershed of the Coast Mountains and its largest river, the Fraser, and where rapidly flowing tidal currents create rich ecosystems supporting substantial animal and plant life. This is a place of significant heritage and culture where people have interacted with the ocean and watershed for thousands of years and a place now home to 8 million people, including over 70 First Nations. It is a place of competing priorities, intricate ecosystems and compelling stories at the crossroads of ancient pathways and new directions. From a biological point of view, the most productive habitats in the region are estuaries – the places where rivers meet the sea (hundreds in the Salish Sea), and fresh water gradually mixes with salt. As well as being vital for fish and wildlife, salt marshes and other wetland vegetation serve as the “kidneys” of the ecosystem, trapping and holding water and air-borne contaminants such as the sulfur in acid rain. The Fraser River carries rich silt and fresh water far across the Strait. This 850-mile long river drains over 20 million hectares — one quarter of BC. The Fraser has the largest salmon runs in North America and its estuary is a vital stopover for migrating birds from three continents. Maximum depth: 650M at Bute Inlet, B.C. The Coast Salish are a group of ethnically and linguistically related indigenous peoples of the Pacific Northwest Coast of North America, living in British Columbia, Canada and the states of Washington and Oregon in the United States. They speak one of the Coast Salish or Salishan languages from which their collective name is derived. The Coast Salish are a loose grouping of many tribes with numerous distinct cultures and languages. 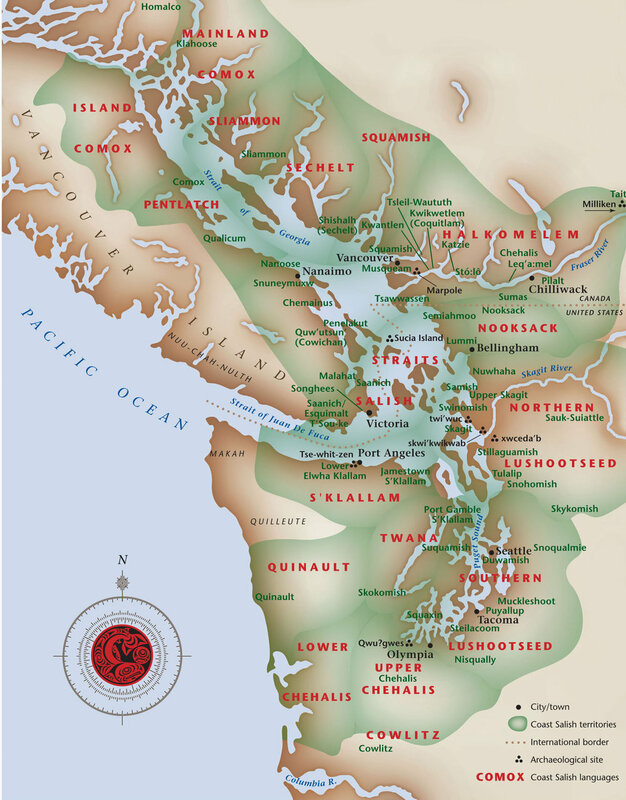 Territory claimed by Coast Salish peoples spans from the northern limit of the Gulf of Georgia on the inside of Vancouver Island and and covering most of southern Vancouver Island, all of the Lower Mainland and most of Puget Sound and the Olympic Peninsula. Their traditional territories and villages coincide with modern major metropolitan areas, namely Victoria, Vancouver, and Seattle. The Coast Salish cultures differ considerably from those of their northern neighbours. It is one of the few indigenous cultures along the coast with a patrilineal rather than matrilineal kinship system, with inheritance and descent passed through the male line. According to a 2013 estimate, the population of Coast Salish numbers at least 56,590 people, made up of 28,406 registered to Coast Salish bands in British Columbia, and 28,284 enrolled members of federally recognized Coast Salish tribes in Washington State. We think the Salish Sea is a place worth conserving and protecting. We hope you JOIN US! Dr. Bill Austin had a dream to create a facility where anyone could learn about the ocean. In 1991, The Marine Ecology Centre opened in Cowichan Bay as a non-profit organization run by the Friends of the Marine Ecology Centre. The Centre operated year round with educational programs for schools, colleges & universities as well as for other community organizations. It was also open to the public for general viewing. In April 2001, MEC packed its bags and floated down to the Port of Sidney marina, where Bill and his team spent the next eight years hosting school programs, summer camps and educational programs. In 1990, at the foot of Beacon Ave in the historic customs house building, the Sidney Historical Museum opened a marine mammal wing. Both parts of the museum operated under one management, the first curator and director Mr. Calvor Palmateer. The Marine Mammal exhibits traced the biology and evolution of cetaceans and pinnipeds. A highlight of the exhibits were the murals gracing the ceilings and walls of the museum. The non-profit group, Friends of the Sidney Museum and many volunteers supported the operations of the museum. As the Marine Ecology Centre rapidly outgrew its small one-room facility, the Sidney Marine Mammal Museum was in need of an updated facility also. In 2004, planning started for the “New Marine Centre at Sidney”. The Town of Sidney became very much involved, and in 2005, with the support of Marker Developments, the Town secured ownership of 10,000 square feet of purpose-built space on the ground floor of the new Sidney Pier building. This breathtaking waterfront space would become the home of the new centre. Construction of the Sidney Pier building started in 2005 and was completed in May 2007. The New Marine Centre (a charitable society) was formed to design, finance, build and operate the new facility. The original volunteer board was made up of members from both the Sidney Whale Museum and Marine Ecology Centre Boards. Angus Matthews was hired as the founding Executive Director on January 1 of 2006. From the outset it was agreed the Centre should be of exceptional quality and focused entirely on the local waters of the Salish Sea. To accomplish this, it was understood that a major investment in equipment and exhibits would be required. Most of all, sufficient funding would be needed to make all this possible. Once the vision and design concepts for the new centre were developed and approved by the Board, the “Discover Your Ocean” Campaign was launched in September of 2006. Led by volunteer co-Chairs Lynda and Murray Farmer and supported by a Campaign Cabinet of leading citizens in the community, an ambitious goal of $5 Million was set. Over the next 16 months, the community demonstrated very generous support for the concept. During the course of the campaign, private donations from individuals totaled $1.5 Million. The team was also successful in obtaining a further $2 Million from the Canada/BC Infrastructure Fund. The final piece of the financial puzzle was our largest single private donation, $1.5 Million from Shaw Communications. To complete the entire picture of community involvement and cooperation, the Town leased the building space to the New Marine Centre Society for the modest rent of $5.00 for twenty years with an option for renewal. On August 12, 2008 construction began to install our facility inside the empty shell of the completed building. From zero to finished in 318 days was an amazing accomplishment and opened to the public precisely on time and on budget on June 20th. Opening day was an exhilarating experience for everyone involved and the 2,000 spectators. Dedicated by the Coast Salish, inspired by special guest Celine Cousteau and officially opened with Mayor Cross, Gary Lunn, Murray Coell and Board Chair Peter Lloyd cutting the kelp ribbon, it was a proud day. The New Marine Centre Society is a registered BC Society (S-0048692) and Canadian charity (CRA #860673094RR0001). Please find below the Society's constitution & bylaws as well as recent year-end financial reports. For more information about the Society or Centre please contact Pauline Finn, Executive Director - pauline.finn (at) salishseacentre.org.